iAMP100M - second generation of 100W stereo OPS with SanKen output devices. More complex design and a lot of SMD components but it was woth it. 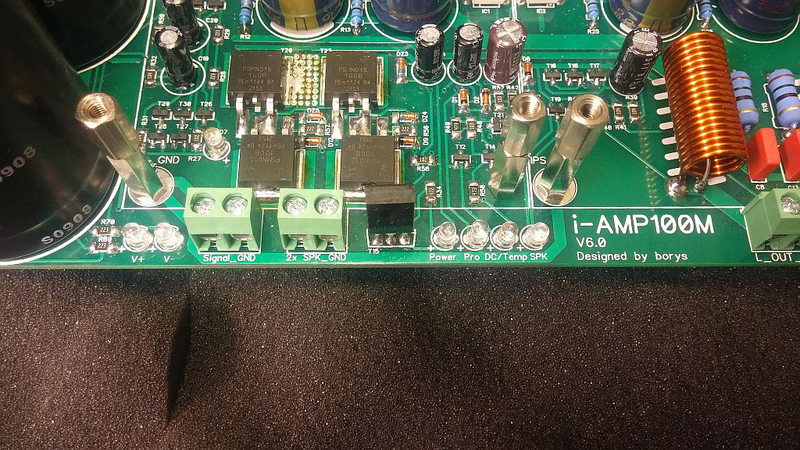 Amplifier board has capacitance multiplier build in. The miltiplier can be easly converted into the stabilised supply but two mosfets on the left side of the board should be placed under the PCB and bolted on to the amplifier chassis ''floor" (it will improve heat dissipation). It is recommended to setup approx 2V of the drain to source voltage drop across the mosfets on the left side of PCB. 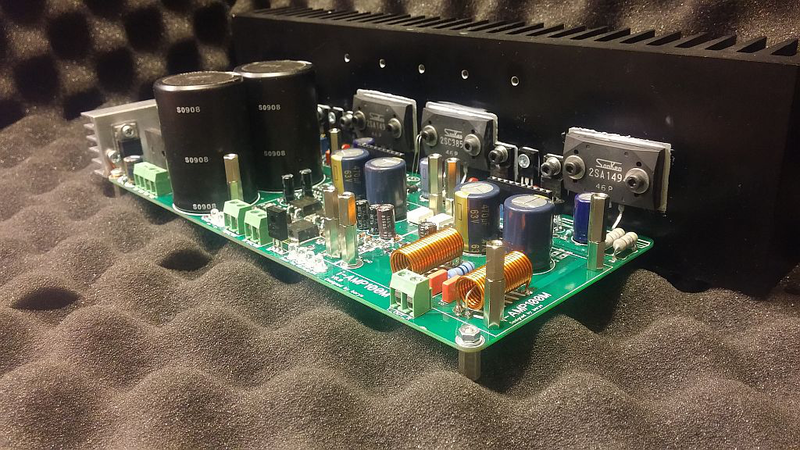 Speakers protection is using SSR mosfet relays so the mechanical components are eliminated (improved reliability, no arcing at switching), lower ON resistance than classic relays (not affecting so much the damping factor of the amplifier), extremly fast switching. SSR relays are fitted at the GND return, so the amplifier output goes dirrectly to the speakers. The short circuit protection is using opto triac as a current sensing element so it doesn't affect the sound coming from the output terminals at all !! (as the VI limiter does). 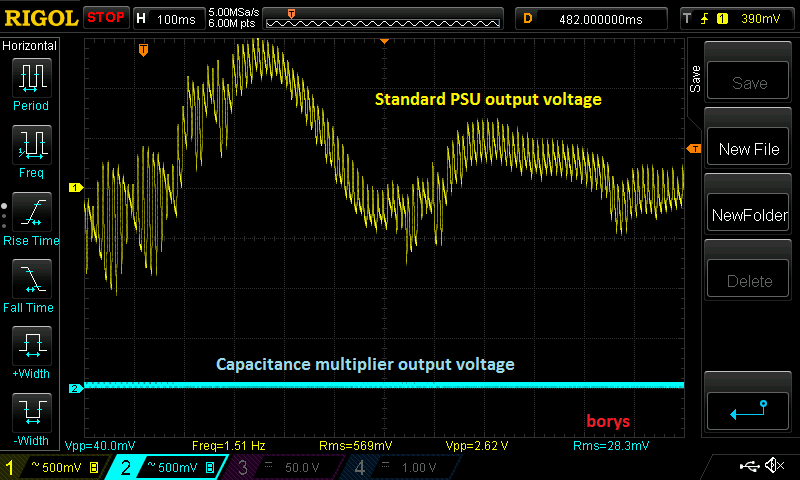 Capacitance multiplier --> This is an active way to increase capacitance and decrease output impedance of the PSU. Both voltage rails have separate capacitance multipliers. The way it works is very simple. 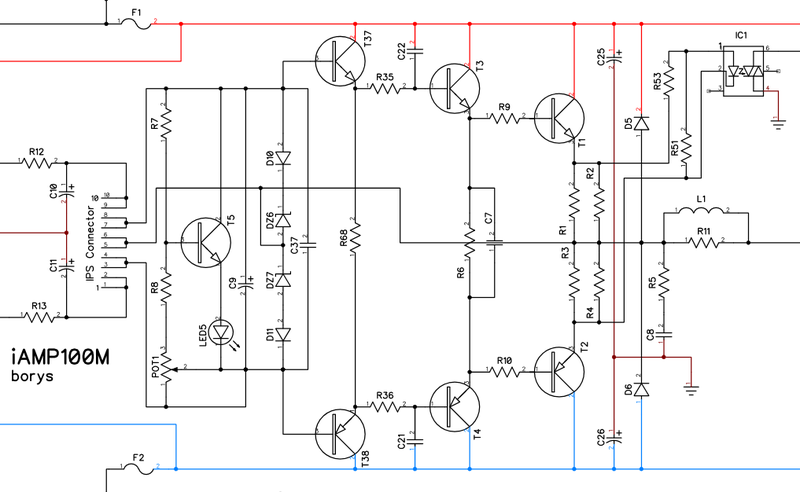 Differential amplifier forms very simple comparator which is sensing the PSU input voltage threw RC network, output voltage is regulated with mosfets at the left side of the board.